The Group’s Working Party goes out regularly to build stiles, clear and waymark footpaths etc. You can see a selection of their work in 2018 by clicking on this link. Also you can view a report on work done in 2017 by clicking on this link. The Working Party acts in conjunction with staff of Ceredigion County Council. Wednesdays or Fridays are the usual days of activity. No one is under any pressure to do more than they are capable of and willing to do. All stiles and bridges erected by the Group have a sign attached to them to indicate that they are the result of volunteer effort organised through the Ramblers. 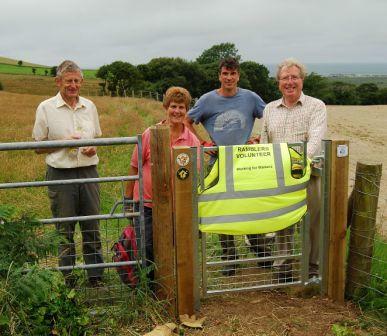 The Group’s Footpath Working Party has received an Award from the Ramblers “for their outstanding work on Public Rights of Way”. The Ceredigion Rights of Way Volunteers have also been awarded Highly Commended Certificates in the prestigious Wales Volunteer of the Year Awards for 2016 and 2018. If you want to come and enjoy yourself working with this award-winning team, and at the same time contribute to the improvements that are taking place, contact us.